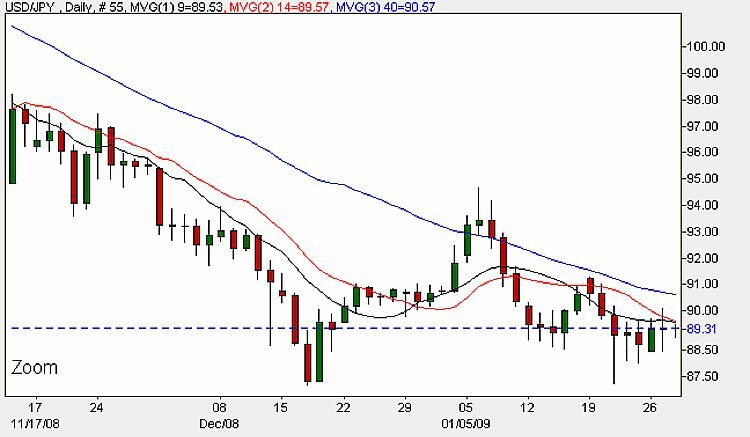 Gosh – hard work trading the yen to dollar pair at the moment, not helped by yesterday’s long legged doji candle, which has given very little in the way of a confirming signal to that of Monday. The pair are now confirmed in a sideways move, and until we see a positive move in one direction or the other, my advice at the moment would be to stay out of this market. As I have mentioned before, we do have the potential for a double bottom as we can see from the above chart above, and this may well develop in due course. If the pair hold above 88.50, we should see a move back to 90 and above, but this region is now very congested. My feeling is that the yen to dollar pair will move up in due course, and possibly on the back of intervention from the Bank of Japan – expect some volatility this afternoon on the release of FED minutes and FOMC rates. I would stay out for the time being, there are plenty of other pairs to trade! The short term trend is sideways, medium term sideways and long term bullish.